My cousin's piece of handi-work. My Great Aunt, Aunt and Cousin are all cross-stitchers. And they're all very, very good. This tradition has sat heavily on my shoulders while I waited for the right moment to learn. That moment was today, at 7am. After hunting for the thread and fabric, I sat myself down in front of this video by videojugartscrafts, which was really helpful and made certain things such as reading a chart much clearer to understand. As I didn't have a pattern to follow I did a bit of freestyle. Here is how I got on. I had a lot of fun doing it, and I can see myself getting seriously obsessed with it... you never know, Tuesdays just might become Stitchin' Tuesdays! Tune in tomorrow to see the lace hat I'm trying to knit at the moment. All I'm going to say is, it isn't going well! It looks good! 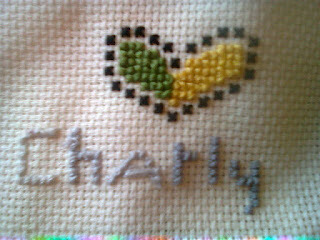 I tried cross stitch before I learned to knit, as a kid. I still remember the little kit I got. It was a glow-in-the-dark frog. I liked it, but never finished it. Me and sharp needles just don't get along. haha. That looks great and well done on a super start. I am a cross stitcher as well as a knitter and I balance the two together so if you get bitten by the bug lol you could find more than a tuesday being taken over .